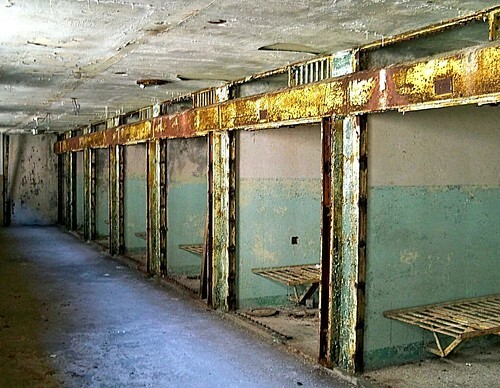 Eastern State Penitentiary (ESP) was designed to be a scary place. 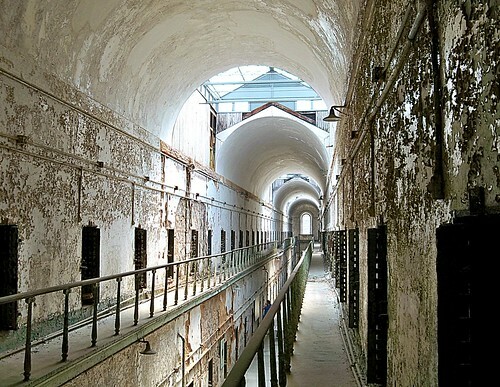 Located in Philadelphia, this abandoned prison turned uber-cool museum has been kept in a state of “preserved ruin”, meaning no significant attempts have been made at renovation or restoration. The empty and ever looming guard towers, rusting doors, crumbling cell blocks and vaulted, water-stained ceilings make this veritable fortress an intimidating place for visitors. It would be easy to assume that the spooky atmosphere could easily be playing ghostly tricks on the imagination, but those who have experienced strange events at ESP say that it is one of the most haunted places on the planet. Rumors about ghosts started to echo through the prison long before the penitentiary was closed down. Almost anyone who spent time at ESP was certain that something supernatural was occurring behind those foreboding walls. Guards often spoke of the sounds of unexplained footsteps in the corridors, pacing feet in cells, eerie wails emanating from the dark corners of the complex and dark shadows that resembled people flitting past darkened doorways. Because of its long history, gloomy atmosphere and ominous appearance, ESP has been often used as a location for TV shows and films about the paranormal. Paramount Pictures used parts of the old prison for the filming of TRANSFORMERS: REVENGE OF THE FALLEN. In the Brad Pitt/ Bruce Willis film TWELVE MONKEYS, it was the setting for a mental hospital. ESP is a favorite spot for photographers, music videos and has inspired several video games. GHOST HUNTER’S catch a “ghost” on film at Eastern State Penitentiary on a walkway just like the one pictured above….WORTH WATCHNG! Less than one minute long. 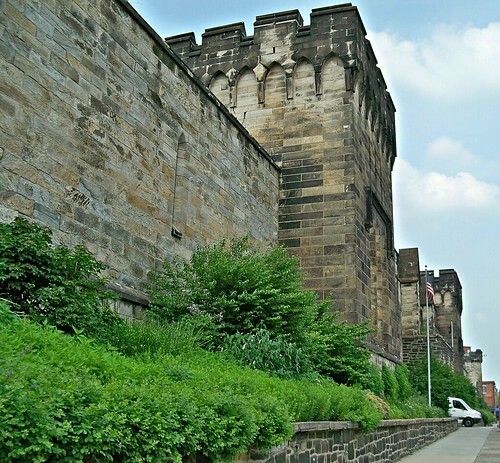 Eastern State Penitentiary is located on Fairmount Avenue in Philadelphia, just a few blocks away from The Philadelphia Museum of Art and The Franklin Institute. I love Eastern State Penn. Great pictures! Cool post and pics, Cheri! Great to see you on RedBubble. The perfect spot to spend the night! Why are abandoned places so intriguing? They are more real than any other representation of history that we can encounter, touching our imaginations and whispering to us about the past in a visceral way. Ruins arrogantly poised, withstanding the passage of time to tell us their story. The effects of nature, people and decay means that these places are dying yet being re-born again with every passing minute as the echoes of the past co-exist with the present.